Laundered and Starched Shirts are typically done Monday thru Friday with two (2) day turn around time. Any shirts needed on Saturday are typically Dry Cleaned which is significanly more in price e.g. $5.40 per shirt. Please bring your laundered shirts from Monday thru Friday to avoid paying a signicant extra charge. Even Same Day Service on Friday, which is 50 cent more per piece, is still much cheaper than Saturday. three (3) hours a day. Note 2: We separate Lights from Darks, and we use Dryer Sheets to make your clothes smell good and feel soft unless requested not to do so. 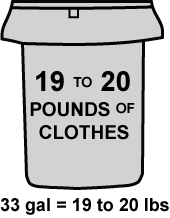 A large 30 gallon trash bag filled to the top typically holds 19 to 20 lbs of clothes. 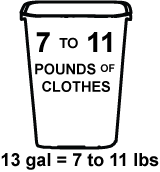 A 13 gallon trash bag typically holds 7 to 11 lbs depending on how heavily packed. Note: Press Only garments must be cleaned before pressing as any spots or stains will be set and made permanent by the iron, steam, or press. The customer assumes all responsibility for any stains on garments. shoes with dress or pants/slacks you plan to wear with garment for accurate meansurement. Note 1: The prices above are for plain items only. Additional charges will be added to the final invoice for special services, materials or conditions such as folded shirts, military creases, silk, linen, down, feathers, cashmere, angora, fur trim, leather trim, beads, stones, sequins, pleats, metallic trim, embroidery, whites, lined items, rush service, heavyweight items, velour, velvet, corduroy, heavily soiled, mildew, mold, etc. See store details for the additional Same day / Next day Service Costs. Note 2: Shirts that are Dry Cleaned are done so to help keep the color fresh as opposed to laundering with water, e.g. jeans that lose their color or stone washed jeans. Dry Cleaning also help to reduce shrinkage. And lastly, Dry Cleaning Shirts also receive more hand pressing, as opposed to machine pressed, which requires more labor. receive a 10% discount with a valid ID. Police Uniform Shirts: $2.75/police shirt. Please see above (on this same page) for table cloths laundry and press only pricing. For regular service of bed sheets and towels, please see above for pricing. Since we do not have unlimited storage space, we are not responsible for any garments or items left 30 days after the pick-up due date.